As lovely as it is having the kids home from school during summer break, it can also mean grasping at ideas for how to keep them entertained. 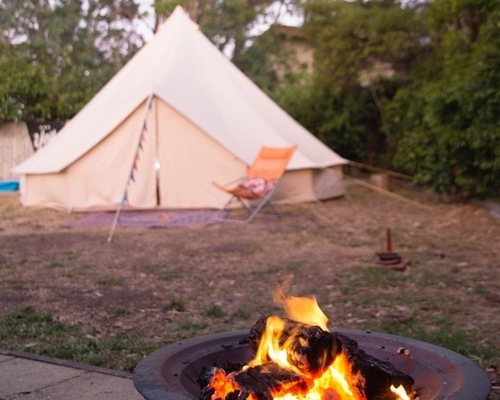 For Australian parents Matt and Lisa Atkinson, this resulted in a decision to organize a fun staycation by setting up a campsite in their own backyard for a week. 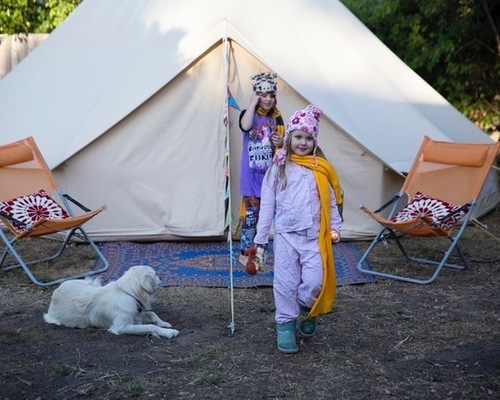 After surprising their daughters, Finlay and Lila, with a stylish camp in the comfort of their garden, these two definitely get the Coolest Parents award. Backyard size: The property is 11,840 square feet (about 1,100 square meters); the backyard takes up about half of that. Matt and Lisa had had a busy year, and by the time summer was near they realized they hadn’t planned anything to do with their girls. “By that stage everything was either sold out or hideously expensive,” Lisa says. If they were going to spend money on an escape, they preferred to go somewhere warm and tropical. Instead, the family decided to stay put at home, with plenty of picturesque beaches close by. Knowing their limitations, the Atkinsons asked camping specialists Happy Glamper to help set the scene. They wanted it to be a surprise, so they took the girls out for lunch while the tents were being set up, and blindfolded them to reveal the grand surprise. “The unveiling was like something out of one of those home makeover shows. It was awesome to see the looks of surprise and delight on their faces,” Lisa says. The goal was to stay outside of the house as much as possible, so they went inside only to use the facilities — and to take advantage of the air conditioning on a couple of especially hot days. Matt and Lisa wanted the family to get away from life’s little distractions, including TV and iPads. Lisa says she wanted to encourage conversations, enjoy the outdoors and have some quality family bonding time. The fun didn’t stop outside. 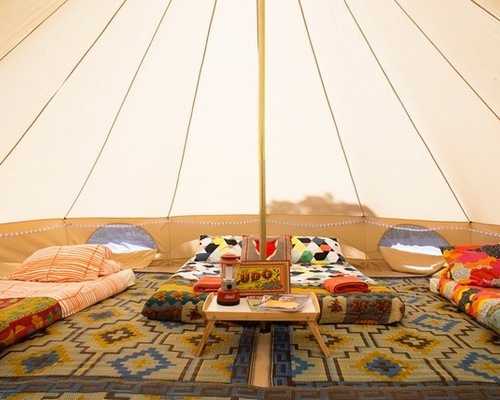 Inside the generously sized tent were comfy beds for Mom, Dad and the girls, as well as delightful decorations, including twinkle lights, cushions, rugs, games and magazines. Gathering around to play board games was a great old-school way for the Atkinson brood to come together as a family. “We love our board games, and Santa brought us a Family Feud board game that the girls were obsessed with playing!” Lisa says. Happy Glamper did a lot of the work for the family, setting up the tent, beds, rugs and chairs. Lisa and Matt also bought some clamshell wading pools, put in a Slip’N Slide and added a swingball set for outdoor fun. As many parents know, summer break can feel quite long. Lisa says they normally try to break it up by going away at some point. However, being at home this time, they embarked on local adventures, including daytrips, movies, beach time and play dates to keep the kids entertained. Fortunately for Lisa and Matt, they work for themselves and so have flexible hours, which helps over the break. “I really feel for parents who have to work full-time and figure out how to keep the kids entertained in the meantime,” Lisa says. For after sunset, the family also borrowed a portable fire pit from a friend so they could have campfires under the stars. Matt had grown up in the U.S. and was eager to give the girls the classic campfire experience with s’mores galore and spooky stories. Lisa found all-in-one s’mores kits, and they made good use of them on this home holiday.